EIR HQ, prior to 1879 14, Theater Road, Calcutta. 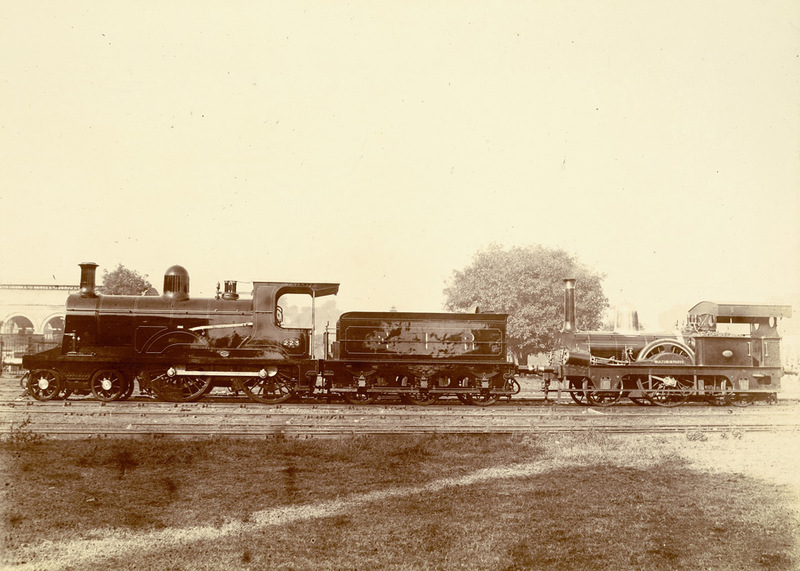 On 17th August,1849, the Court of Directors of East India Company signed an agreement with EIR for construction of a short experimental line from Calcutta to Burdwan, originally proposed by the Company in 1845. The East Indian Railway Company’s Managing Director Macdonald Stephenson, George Turnbull, the company’s Chief Engineer, and the engineer Slater made on 7 May 1850 an initial survey from Howrah (across the River Hooghly from Calcutta) to Burdwan on the route to the Raniganj coalfields. Accordingly, the first train of EI Railway started its historic ‘zero mile’ journey in August 1854 from the very place where the Howrah Station stands now. “The train flagged off full to its capacity from Howrah to Hooghly a distance of 24 miles. 3000 applications were received for the first ride, but only a few could be accommodated. The train having three first Class, two second class and three “trucks” for the third class passengers, a brake-van for the Guard all constructed in Calcutta, left Howrah at 8:30 A.M. and reached Hooghly after 91 minutes. During the first 16 weeks, the company carried 109,634 passengers: 83,118 third class, 21,005 second class and 5511 first class. See Grace’s Guide ”That day onward, the EIR ran a regular service, morning and evening, between Howrah and Hugli with stops at Bali, Serampore and Chandernagar. The fare ranged from Rs.3 by first class to 7 annas by third class. Initial plans for the first Howrah station were submitted by George Turnbull the Chief Engineer of the East Indian Railway Company on 17 June 1851. The government authorities, however, were not too keen to acquire as much land as the Railway Company required, taking into account the enormous anticipated growth rate of the proposed rail station. In May 1852 Turnbull resubmitted his station plans complete with details – a major work of him and his team of engineers. In October four tenders were received varying from 190,000 to 274,526 INR against an estimate of Rs 250,000. As we understand from IRFCA source, there was no official image available with them to suggest what was ’the shape of the station shed before it was demolished to give place to the new station building’. The only visual document on their hand was a ‘Photograph’ of Howrah station printed in ‘The Steam Engine and the East Indian Railway‘ – the first ever historical work on E.I.R. by Kalidas Moitra, published in 1855. The indistinct print, however, leaves open a possibility of its being a hand-drawn illustration, instead of a photograph, of the model of the first Howrah Station. This view can be well supported by a recently unearthed photograph entitled ‘Railway station near Calcutta’ captured in 1895 by American photographer, William Henry Jackson (1843-1942), for the World Transportation Commission. The photograph is featured here at the top. The following lines picked up from a recent review of Calcutta’s past may neatly recap the story told here.